On Thursday, 19 April 2012, some nine months after London’s civil disturbances, the Most Rev Vincent Nichols, the Archbishop of Westminster, has met young people in Hackney who are helping to create safer neighbourhoods. He joined students from Our Lady’s Convent High School in Hackney to go on a CitySafe walk, walking along Upper Clapton Road to talk to local shopkeepers to see how crime and violence can be combated. "I am delighted to lend my support to the work of Our Lady’s Convent High School in Hackney in making their local streets and communities safer. As part of the City Safe campaign, led by London Citizens, students from the school have been working with local shops to build trust between shopkeepers and those who buy from them. This helps to create a sense of togetherness, with the aim of making people feel more secure and to improve the neighborhood. In this way local schools, faith communities and charities can complement the work of the police and local authorities and help to reclaim the streets from crime." "Although their stories are seldom told, it is important to recognise that across the capital, through prayer and practical action, many young people are trying to make their city a more just and peaceful place. London should take great hope from their spirit and determination which expresses the true nature of the human heart, a heart made ready by God to be a treasure trove of goodness ready to be shared." "Later this year, the message of peace will be heard even more strongly in London as young people in Catholic schools and parishes take part in One Hundred Days of Peace. From Friday 8 June 2012 (fifty days before the opening ceremony of the Olympic Games) to Sunday 28 October 2012 (fifty days after the closing ceremony of the Paralympic Games) they will uphold the ancient Greek tradition of a sacred truce. One of the highlights of One Hundred Days of Peace will be a Peace Icon which will travel to churches in the dioceses of Westminster, Brentwood and Southwark to offer a focus for prayer and reflection." "We are honoured that the Archbishop of Westminster will be visiting our school. The girls have done fantastic work and we are very proud of them. We are really pleased that he has acknowledged the work that the girls and the RE team have done at Our Lady’s Convent High School and that he is coming to see Catholic social teaching in action." Pioneered by London Citizens, CitySafe builds the power of local communities to tackle crime and the fear of crime. The CitySafe campaign has been developed through conversation and research involving hundreds of young people, youth workers, teachers and community leaders. At the heart of this process has been the voice of young people saying we are not the problem, we are the solution. 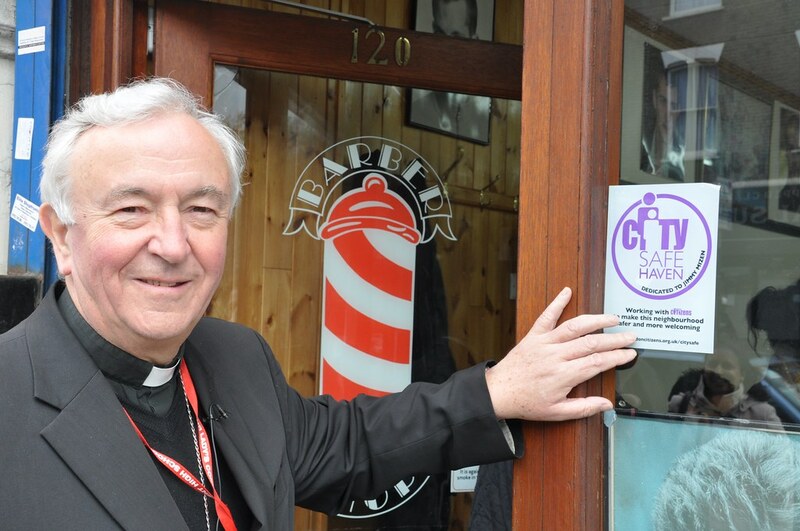 CitySafe has got the support of 100s of business leaders (more than 400 local shops have signed up to become CitySafe Havens), Political leaders (e.g. Vernon Coaker MP, former Minister for Crime Reduction; Boris Johnson, Mayor of London; Lewisham Mayor Steve Bullock, Tower Hamlets Mayor Lutfur Rahman, and others) and Police officials (e.g. Borough Commanders in Newham, Greenwich, Hackney, Lewisham, and other places). It is supported by the member schools, churches, mosques, trade unions, universities and charities that make up the Citizens UK alliance.